Sometimes Facebook has a game where it shows you your most often used words as a digital image depending on size. If such a game existed for my conversation with clients, the word or phrase that would be the largest up front and center would be IT DEPENDS. How much financial support can I expect? It depends. How long will it last? It depends. How long will my divorce take? It depends. How much will my divorce cost? It depends. As a lawyer, I have learned to not make guarantees. There are way too many variables. I have to gather all the facts. Some of my engineer clients want things to be more definitive. They want probabilities or percentages. They want rules. There must be rules. My creative types also don’t like uncertainty. They expect that they hired me — the expert. And here I am with all these depends and maybes and wherefores. The standard for spousal maintenance (sometimes still called alimony) in Washington State is “need and ability to pay.” See: I told you the answer is “It depends.” As far as costs and length of time, there are just too many variables to account for. 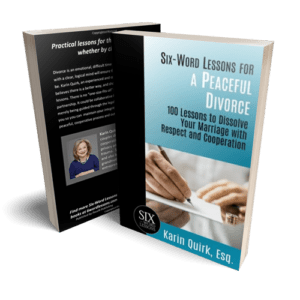 The minimum waiting period for a divorce in Washington State is 90 days but there are many many reasons it can take longer. The same with costs. Here I really try to be more definitive. I do work with a flat fee but, you guessed it, even that depends. As your lawyer, I will explain the options, the probabilities, and the law. Just don’t ask me for a final answer — it depends.